We’ve put a lot of time in airports this month traveling around the US and visiting with family and friends in New Jersey, Virginia, Washington, Colorado and now, Texas. However, it wasn’t the time on the road that’s become the glitch in writing the blog or the time spent shopping for new gear for the next leg of our travels or even the time spent catching up on all that’s happened in the two years we’ve been gone. Replacing our heavier and older computers with newer models using Windows 8 has proven to be our downfall… ARGH! So we’ve decided to take a break from posting stories of our travels and places we’ve visited for a couple of weeks. This way we can figure out the intricacies of our new computers and the Windows 8 operating system, catch our breaths and kick back for a few days. Look for our next post on Saturday, September 6th, where we’ll finish our Panama series and then…Ecuador! Panama is the southernmost country of Central America and is comprised of a variety of stunning landscapes and seascapes, white and golden sand beaches, rolling hills with farm and ranch lands, mountains and, of course, cities and people. During our travels in July we took hundreds of photos and we wanted to share some of our favorites this week. We’ve spent the month of August crisscrossing the US visiting family and friends on a long overdue trip back “home”. Our travels started at the beginning of the month flying in from Panama to New Jersey for a few days and followed by a ride to Washington D.C. via Amtrak. Later we flew to Spokane, WA. for a mini-family reunion. Another flight a few days afterwards took us to Denver, CO where we’re currently visiting more family including our son and grandson. Our last stop in the US will take us to Corpus Christi, TX before we head to South America in September. There we may just have to take some time off to recoup from a hectic month and catch our breaths! Leaving David in the early morning we were off for the Caribbean coast to see the reputed number one tourist area of Panama – Bocas del Toro. The day was bright and hot, promising to be another scorcher. Feeling a little less confident about our navigating skills and, again, embarrassed at our fractured Spanish, it had taken us two circuits bumbling around the large and confusingly chaotic, triangular-shaped bus terminal of David before we found the boarding area for the bus bound for Chinguanola that would send us on our way . 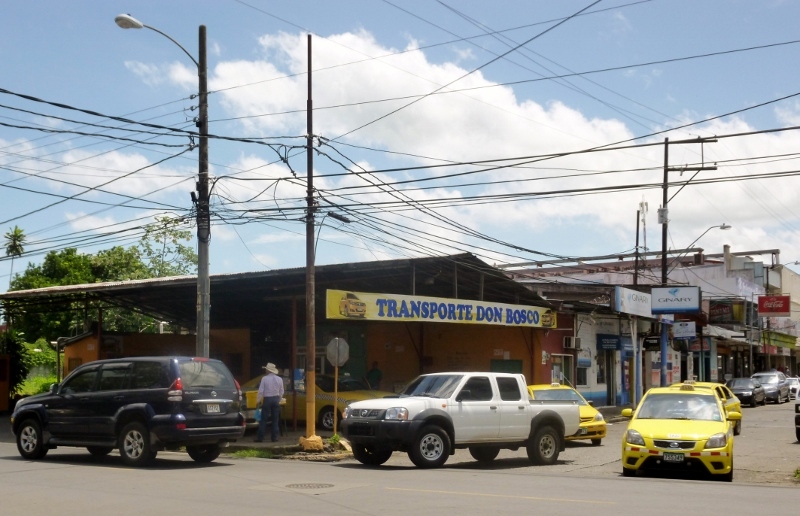 The bus was a twenty-four seat vehicle, a mid-size in the world of Panamanian buses, and it left David far from full, departing the terminal with only seven passengers. We headed east down the Pan-American highway which was under construction; a perpetual condition here in Panama we had been told. 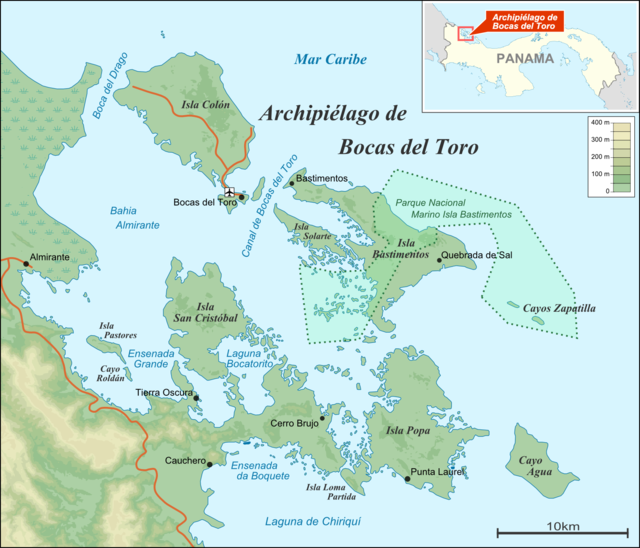 We left the Pan-Am near Chiriqui and began the slow ascent towards the continental divide on our way to the archipelago of Bocas del Toro and Bocas Town on Isla Colon. As we climbed towards the summit the air cooled and it began to mist; wispy, feathery clouds crept out of the valleys and clung forlornly to the ridgelines. Peering down into the valleys revealed a fractured and folded terrain for Panama is a new land. Somewhere around four million years ago, an eye blink in geologic time, massive tectonic plates ground together and this magical landscape up-lifted and created the land bridge between the northern and southern continents. Just past El Valle de la Mina, near the summit of the continental range, the distinction between the sky and the road began to disintegrate rapidly. The white-greyness of the air merged with the grey-whiteness of the undelineated concrete highway and the misty rain played havoc with depth perception and object identification. The bus crept and climbed slowly along the dizzying curves of the winding road as the windows streamed with moisture. As we descended from the summit and made our way to the coastal area, the visibility improved somewhat although it had begun to rain steadily and with great purpose. The bus stopped repeatedly, filled to standing room only and emptied and filled and emptied again, with chattering,neatly dressed, uniformed children finished with another day of school. The sky cleared briefly and the sweltering heat enveloped the land only to be replaced again by more heavy rain as the thunderheads moved in off the Caribbean. Almirante, the jumping off point for the water taxi to the Bocas del Toro archipelago and Bocas town, may have seen better days or perhaps it was always neglected and dirty. 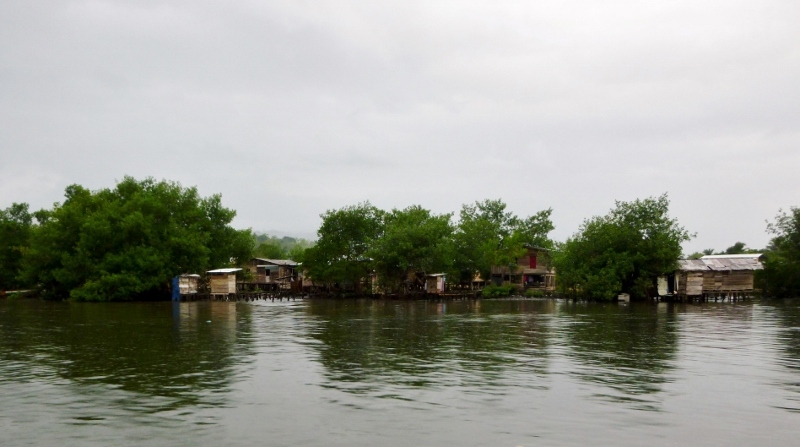 We grabbed a cab from in front of the dilapidated bus stop but the scenery only deteriorated further when we arrived at the waterfront where outhouses perched at the ends of docks extending out from ramshackle homes. After purchasing our tickets for the water taxi we wrapped our backpacks in waterproof covers to protect our laptops from the rain and hunched protectively over the packs in our laps (rather resembling gargoyles at this point) as we hunkered down in the launch. Rain dripped down the sides of the canvas tarp overhead and splashed into the boat from the sides as the water taxi gained speed and we endured the half hour ride to the island. 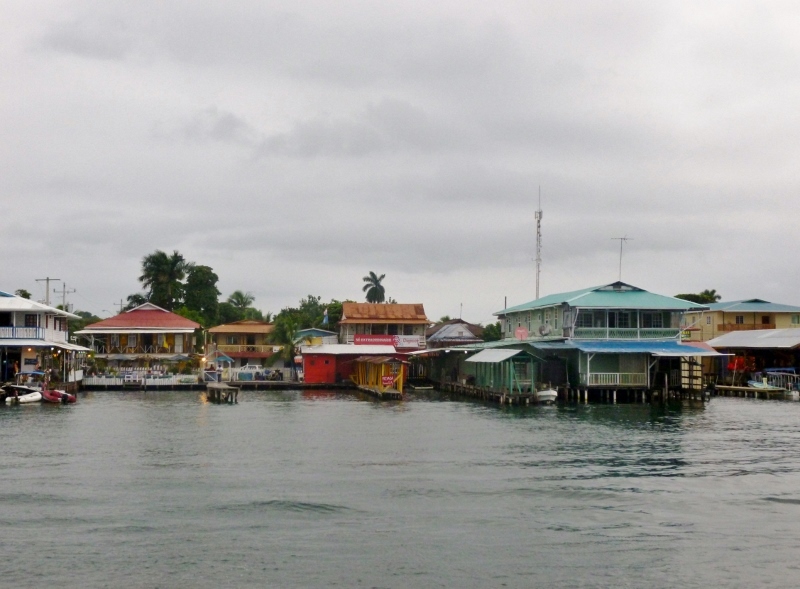 And, you ask, was Bocas del Toro worth the time and effort? We might have to rethink scheduling any future visits during the rainy season, which according to one local, was one of the wettest years he could remember. However, most afternoons we could count on the sun making an appearance and a few hours of no rain so that we could explore around the colorful Bocas Town and the Isla Colon. We managed a day trip on a catamaran sailing to Isla de San Cristobal and Isla Carenero among numerous little islands. 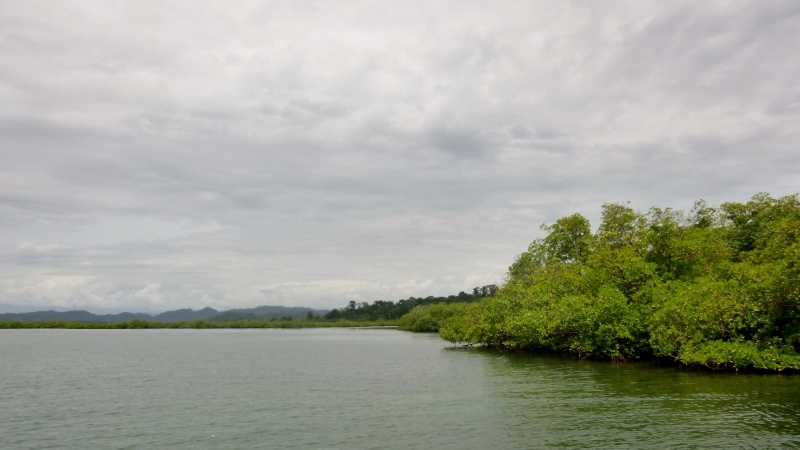 We anchored a couple of times to swim and snorkel alongside a shore tangled with mangroves above a fantastical reef which included startling deep purple and brilliantly golden coral and other fabulously shaped and colored occupants. An amazing number of plumped up, rosy-colored starfish, resembling pictures from a children’s book, rested on the sand or draped over the coral inhabitants in the reef garden. 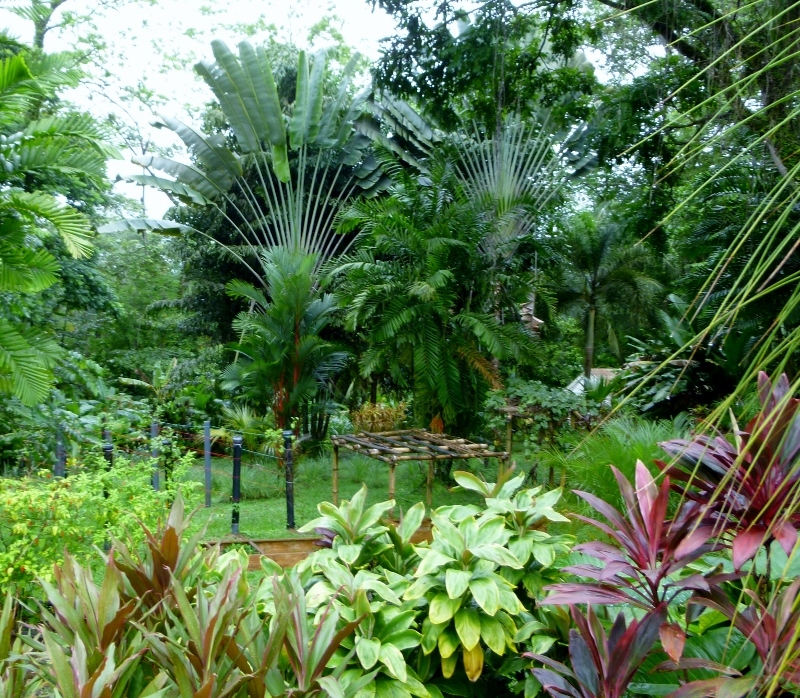 Another day we unfurled umbrellas and spent a few hours following an energetic English expat as she showed us her incredible botanical garden paradise, Finca del Monos, spread over 27 acres. 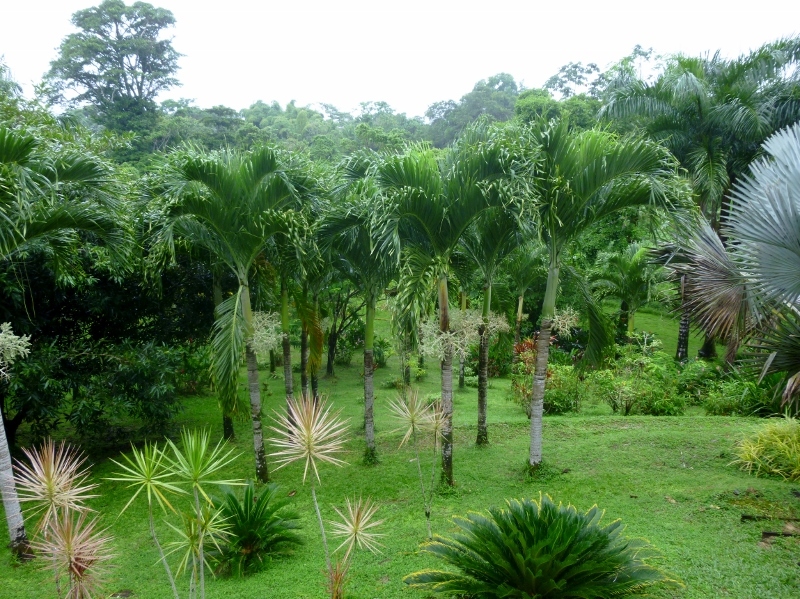 Panama is a country of a few large cities interspersed between small towns glistening with puddles following a rain or a coating of dust in the dry season, wide spots on winding highways often with magnificent, breathtaking scenery. And, at the end of yet another long bus ride, we found ourselves in David on our way to other places. Our battered Lonely Planet Guidebook, a 2010 edition given to us by a friend in Nicaragua, advised us of to think of David (pronounced Dah Veed) as a major agro-business and commercial center rather than a cultural hub. 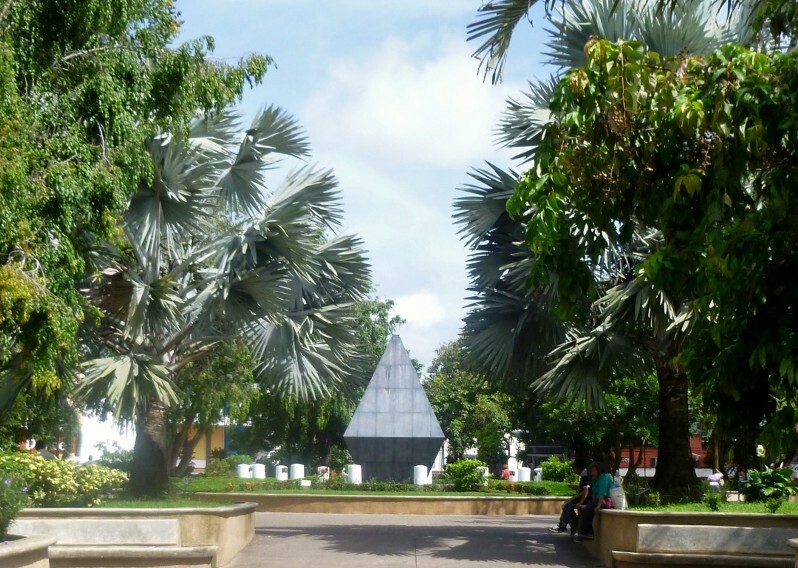 Further digging informed us that it was a popular tourist destination and the second or third largest city in Panama, depending on the source, with a population of roughly 150,000 souls. 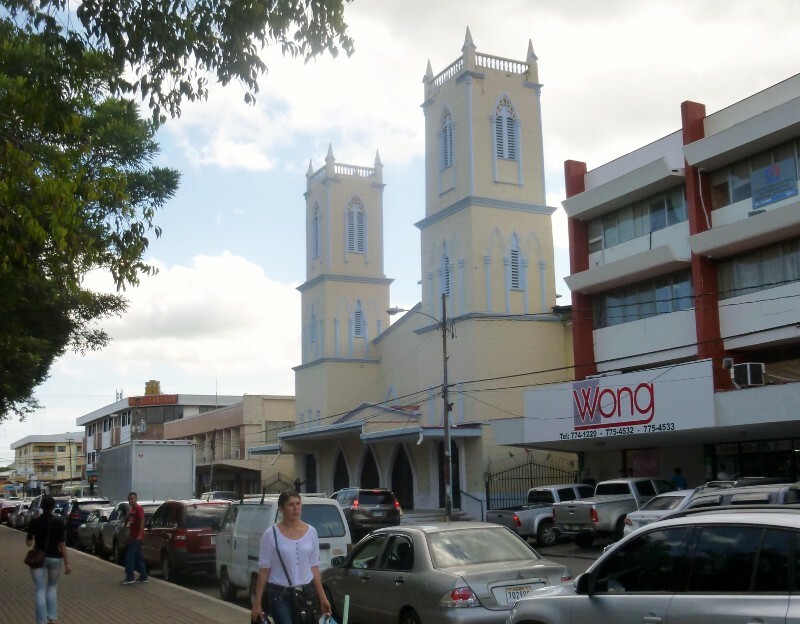 As the capital of the Chiriqui Provence, the city of David and the surrounding area is rumored to be attracting ever more foreigners interested in relocation and might even be poised on the brink of major growth in both its economy and population. Although David was founded in 1602 there is very little sense of historical importance or any impressive architecture. Indeed, the present was much more in keeping with a city devoted to the reality of commerce minus the frills of the arts and letters. 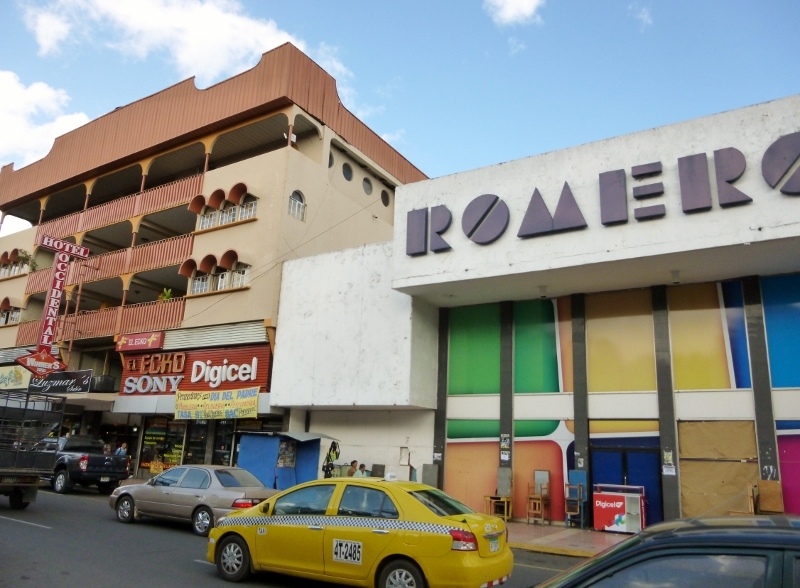 The center of the city, which radiates outward from Parque Cervantes, is a utilitarian affair which quickly turns drab or run-down in a couple of blocks if you head in the wrong direction. And Cervantes Park, while neat and stylistic, is not particularly appealing to the eye or the seat of pants for the foot weary pedestrian or the casual people watcher. We took a bus out of David and headed up into the mountains, less than an hour to the north. 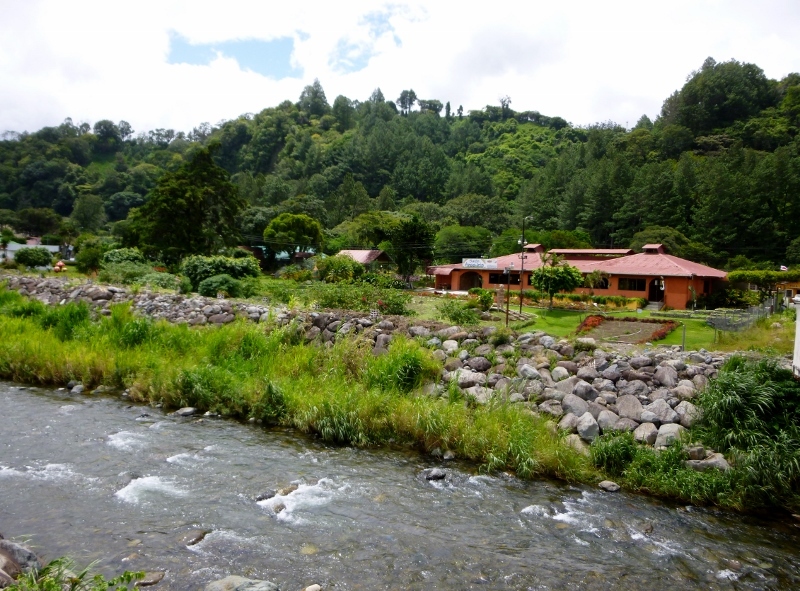 Here we encountered Boquete, a quiet mountain town of roughly 5,000 people and prized by Panamanians for its refreshing climate and pristine natural setting. 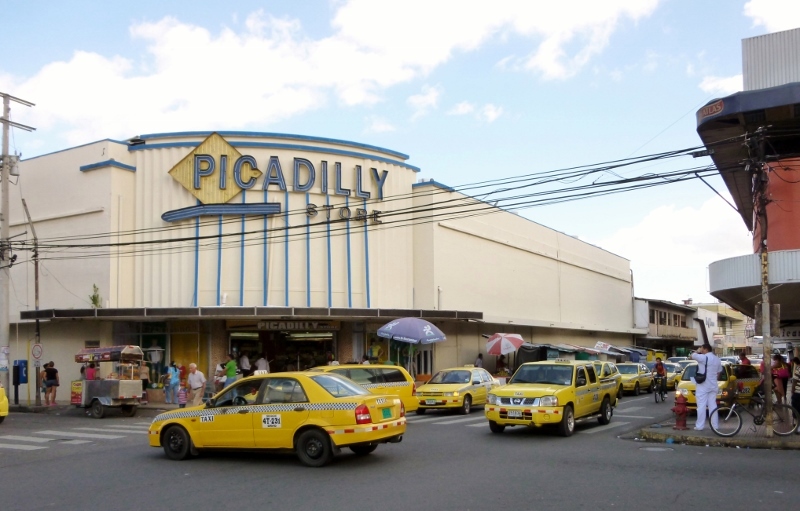 This is the same locale selected a dozen years ago as one of the top four overseas destinations for retirement by Modern Maturity, the magazine of the AARP. So, aside from the gated communities which dot the hillsides, and are currently spilling onto the crowded valley floor, and disregarding the astronomical real estate prices which to seem to start at around a quarter of a million dollars, Boquete is an attractive place. Due to the fertile soil, flowers, coffee and citrus all do well in this beautiful mountain town and the surrounding valleys. 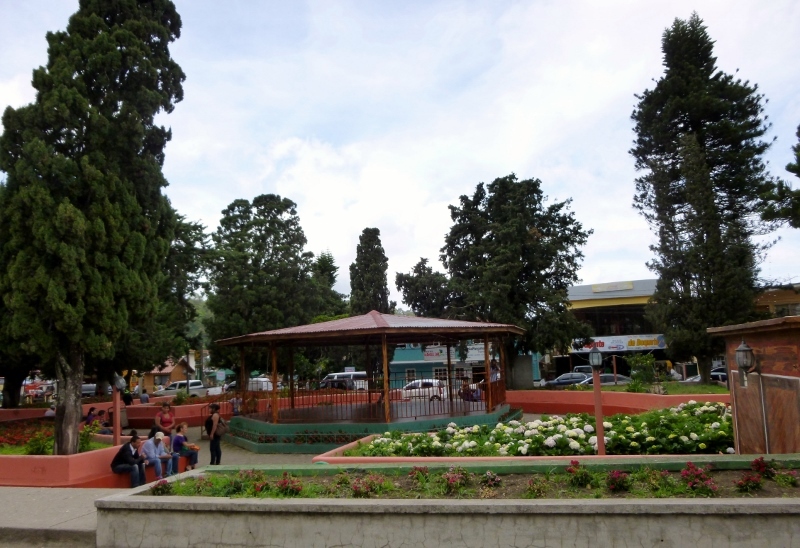 The city provides a picturesque central square which is clean, compact and welcoming for relaxed chats or simply watching the folks flow by. The presence of sweaters and light jackets might be what confirms the fact that one is in the mountains rather than at a beach resort judging by the relaxed and convivial atmosphere of the people. Returning to David from the crisp and invigorating climate of Boquete we couldn’t help but compare the two cities. Perhaps the geography best sums up our apathetic response to David. One city nestled in the mountains and the other, situated below a dormant volcano, sweltering in a basin with reputedly one of the hottest climates in the Central American region. It was definitely time to blow this burg and head for points more interesting and, hopefully, a little cooler!